Mets general manager Sandy Alderson collapsed while talking with reporters during a news conference to announce a contract extension for manager Terry Collins, then was able to walk away. The said Alderson did not eat breakfast, felt lightheaded under the lights of the news conference and fainted. The Mets said he was being examined by the team's training staff. Alderson and Collins sat at a table for the 20-minute formal portion of the news conference Wednesday in the Citi Field interview room, and Alderson then spent about 10 minutes answering questions from broadcast media. He switched sides of the room to speak with text media and was 13 minutes into that session when he confirmed the Mets had given permission to the Los Angeles Dodgers to speak with New York bench coach Bob Geren about their open manager's job. Alderson was asked about outfielder Juan Lagares' doctor's appointment Wednesday when his eyes became glassy and he started to fall. Alderson was grabbed by reporters and photographers, preventing him from falling onto the riser hard. Placed on his back, Alderson was down for about a minute, then was assisted to his feet and into a chair. "So where were we?" he joked with a smile before he walked away with other team officials. 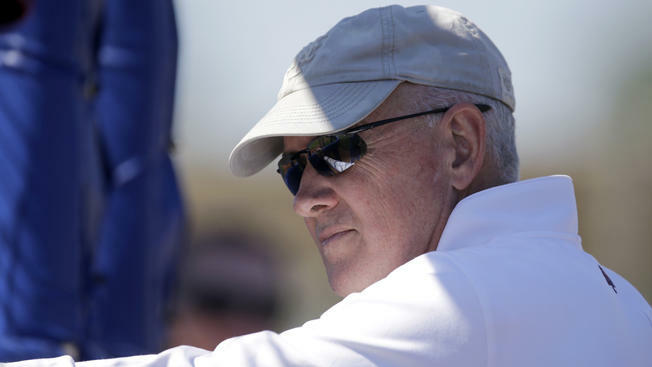 A former Marine who turns 68 on Nov. 22, Alderson became New York's general manager in October 2010. He was Oakland's general manager from 1983-97, Major League Baseball's executive vice president of baseball's operations from 1998-2005 and San Diego's chief executive officer from 2005-09.